Article by Marcy Stamper. Photographs by Sol Gutierrez. 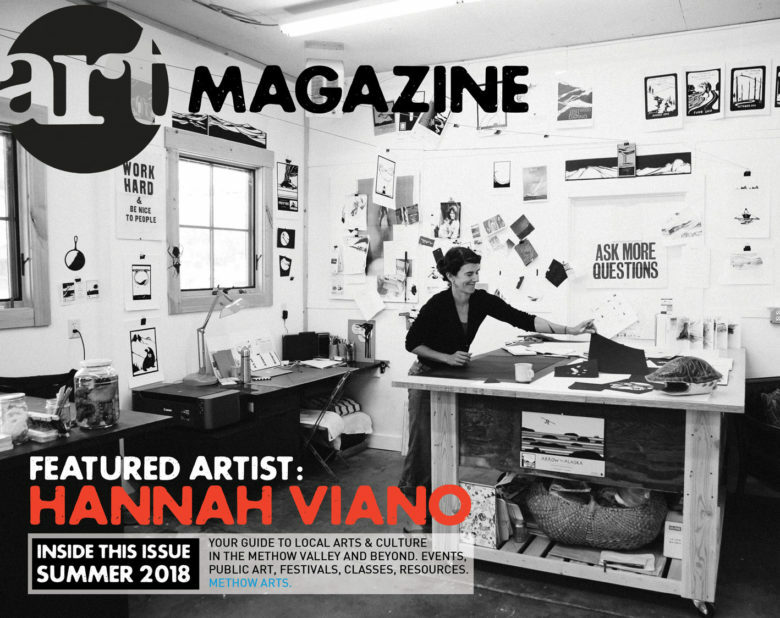 Hannah Viano knows it’s a rare privilege to, as she puts it, “think of my favorite things in life and mush them together – what job could they be?” and then actually do that job. It’s even rarer when that job combines visual art, alternative modern dance, and natural-history education. But Viano, an artist who makes everything from beavers to seascapes to octopi by slicing shapes out of black paper, has merged her diverse interests into a flourishing art career. 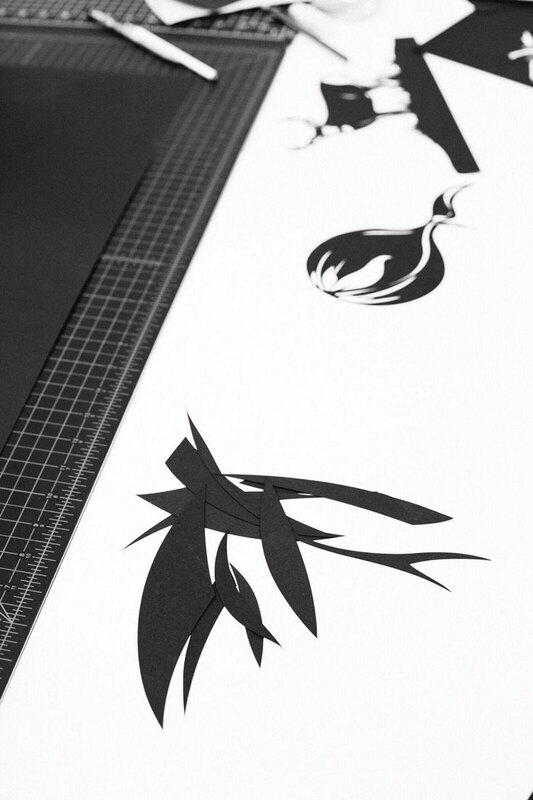 Cutting long, sinuous contours out of large sheets of paper with an X-ACTO knife is actually very much like dance, said Viano. “Getting smooth curves – that’s my favorite part, my dance part. That’s why I can’t get away from waves and clouds that are swoopy,” she said. In addition to the big gestures, Viano removes tiny bits of paper with her knife to create details like leaves and animal tracks or to add depth or texture. Making things by hand – like the sketches Viano makes in the field to remember a scene or to generate ideas – indelibly imprints the image. “It transfers the memory into our body with hand movements,” she said. Viano, who grew up on the coast of Maine in a family devoted to sailing (she describes her parents as “boat hippies”), has also integrated her life-long experience with boats into her art career. While today all these interests have come together, they were once distinct paths. In fact, Viano didn’t devote herself to visual art until after her son, now 9, was born. Viano had been working for the outdoor-education organization Outward Bound, which meant being on expeditions for months at a time to teach on boats or in the mountains. “I always did art, but not as a business venture,” she said. But going off to work for three months on a boat halfway across the world wasno longer practical after becoming a mother. “It was a clean-slate moment,” she said. Viano was quite intentional about figuring out what to put on that slate. She took a choreography workshop, tried to find a publisher for children’s book she’d written (but not illustrated), and took a class in cut-paper art. 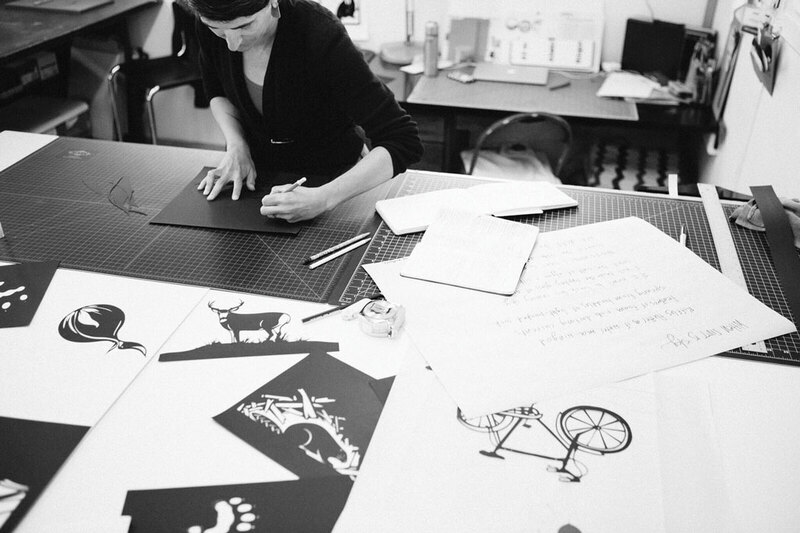 While the process didn’t immediately clarify her decision – she still loved all of them – the cut-paper art took off. Viano soon had a solo exhibition, sold every piece in it, and started to get commissions. 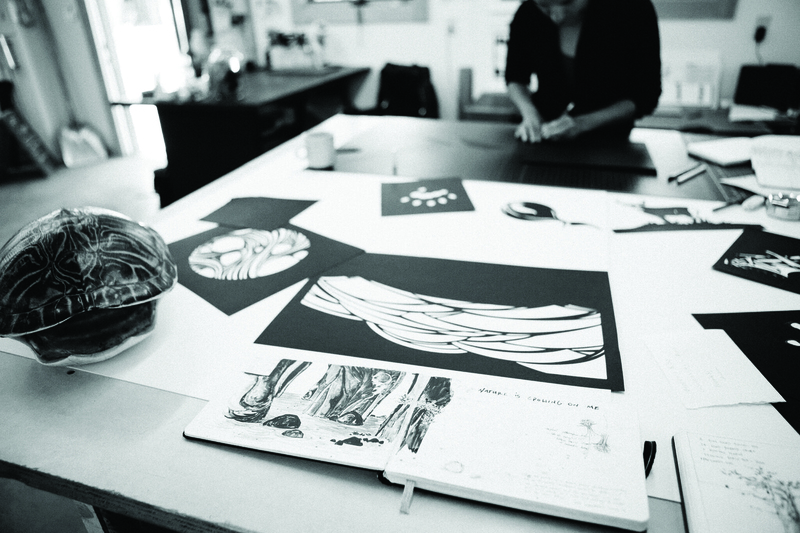 Discovering cut-paper art was a revelation for her. “When I started doing this, it felt very different. There was so much to explore and learn. It drew me – it was something I could do with my hands, and with simple tools and no weird chemicals,” she said. She also liked the crisp, modern graphic images and the links to historic traditions of cut-paper and stencil art from around the world. Viano had always loved art, and even thought about going to art school, but her high school was almost exclusively oriented to academics. “I had parental support, but no school support,” she said. So she turned to something she knew and loved, and started working on boat crews when she was still in her teens. She got her captain’s license at age 19. All those years of using nature to teach and spur the imagination still inspire her art. Viano’s first book grew out of a grant-supported project she developed to teach kids about reading, nature, and art. She’d been volunteering at her son’s preschool and found herself looking at the illustrated alphabet tacked to the wall, with its standard, uninspiring images from balls to zebras. Viano wanted to make an alphabet that would highlight flora and fauna of the Northwest, like anemones, queen bees, and salmon. 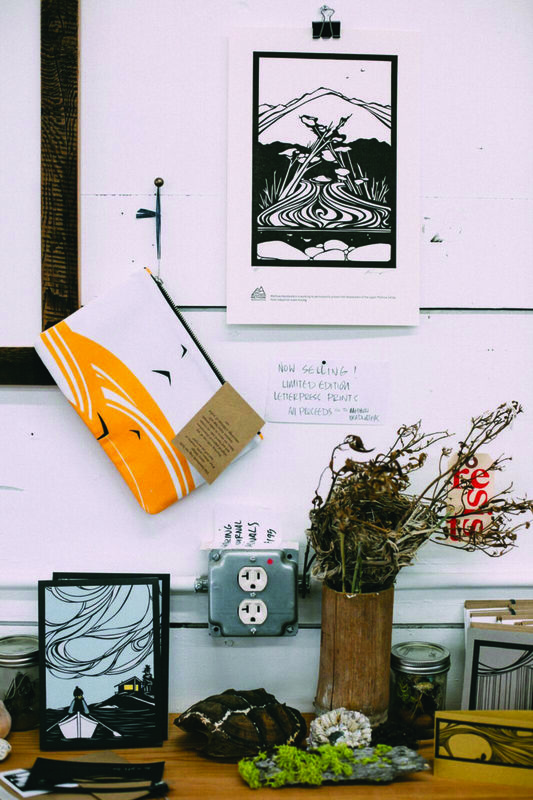 The grant paid for her to hand-silkscreen the alphabets, which were donated to 30 schools and libraries in Seattle, and for her to lead workshops at some of the schools. 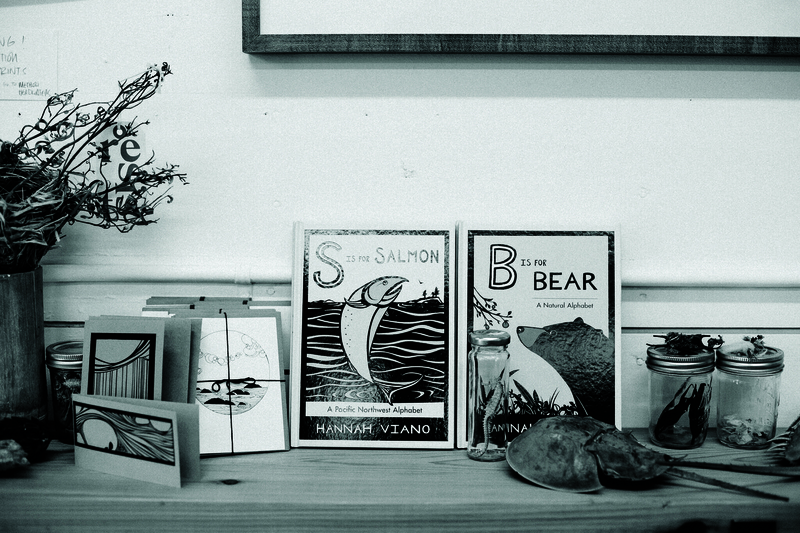 The project ultimately became Viano’s first book, S is for Salmon, which features Viano’s illustrations and her brief descriptions. 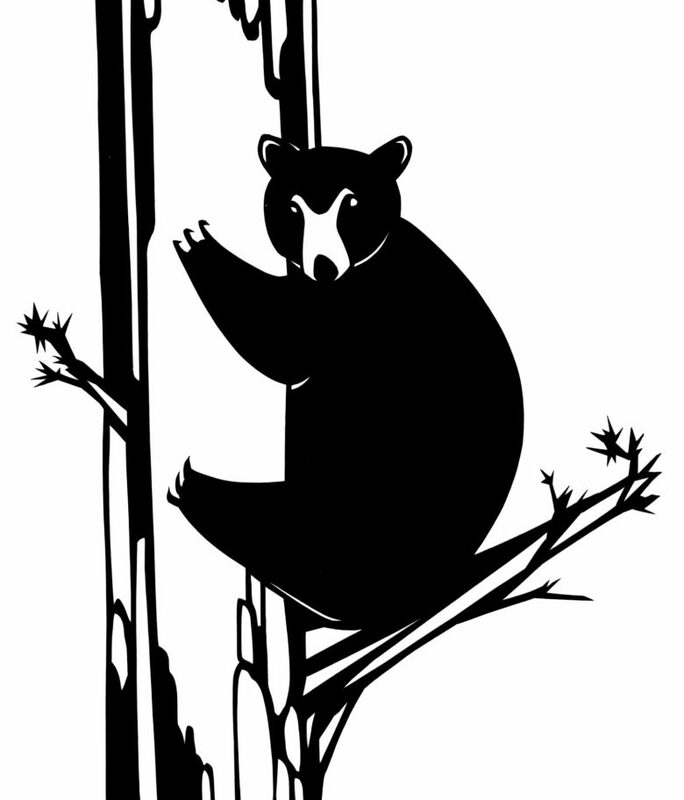 She followed that up with B is for Bear, a natural alphabet for plants and animals from other parts of the country. Another of Viano’s projects, “Wonder In The Woods: An artful identification of 6 Northwest trees,” was conceived as a way to encourage people to notice both nature and art. “For someone who doesn’t go into an art gallery or carry a tree guide – how do you catch the attention of people who are not in either group?” she said. The folded cards, which were available for free at parks and nature centers around Seattle, contain stylized depictions of trees such as Douglas fir, big leaf maple and Pacific madrone. Viano’s artwork is primarily line and form. It makes the most of the bold, graphic contrast of positive and negative space, usually in black and white. 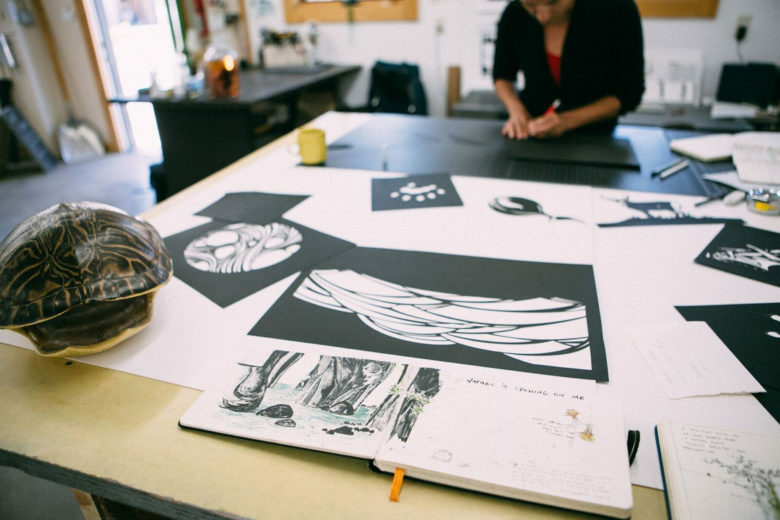 She makes abundant use of concentric circles and undulating lines to convey details and movement. Naturally, there are lots of water scenes, with fish and whales and boats, but also depictions of mountains, deer, icebergs, and wolverines. Viano occasionally layers sheets of black paper or different shades of white to add subtle texture or suggest atmospheric conditions like fog. “I don’t want to lose the contrast of the black and white, because I love that so much,” she said. Some projects incorporate color, usually a limited palette that highlights the exuberance of her meandering lines and shapes. “I’ve always been shy of color, although I’ve loved it,” she said. 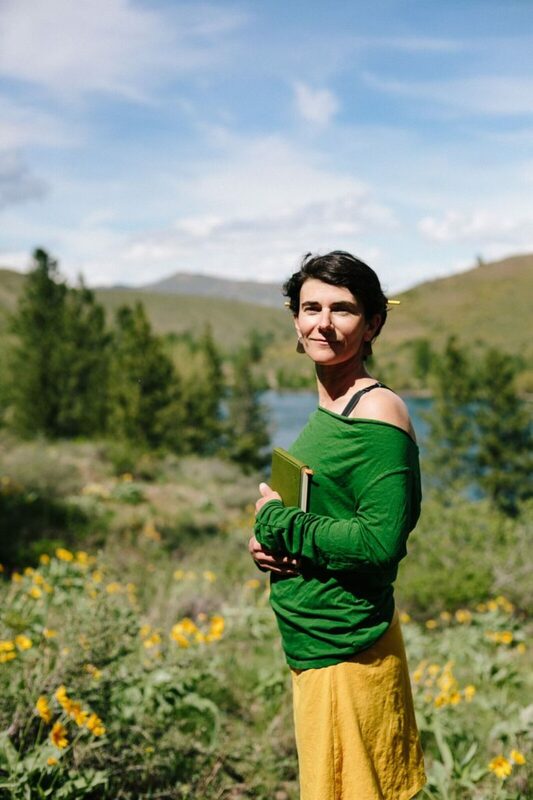 She’s published four books and is nurturing ideas for others, including a “very Methow story” about a family enjoying the snow. Viano is also finding more opportunities for collaborations with other artists, where her designs are transferred to metal or clay. 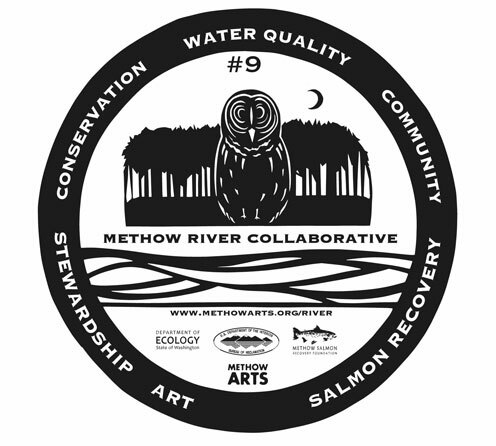 Viano is currently working on a series of 10 panels that feature wildlife such as herons, beavers, and salmon for the Methow River Collaborative, a new initiative by Methow Arts, Methow Salmon Recovery Foundation, the Department of Ecology and the Bureau of Reclamation. The artwork, which will be etched on steel by local metal artist Tim Odell, will be installed at locations around the valley, both along rivers and at places in town to direct people to the water. Viano has also done several public art projects. She designed the art for seating and fixtures for the TwispWorks plaza and has a commission for a building in Seattle. She also recently completed artwork that was transferred to metal and installed along the Methow Trails network. 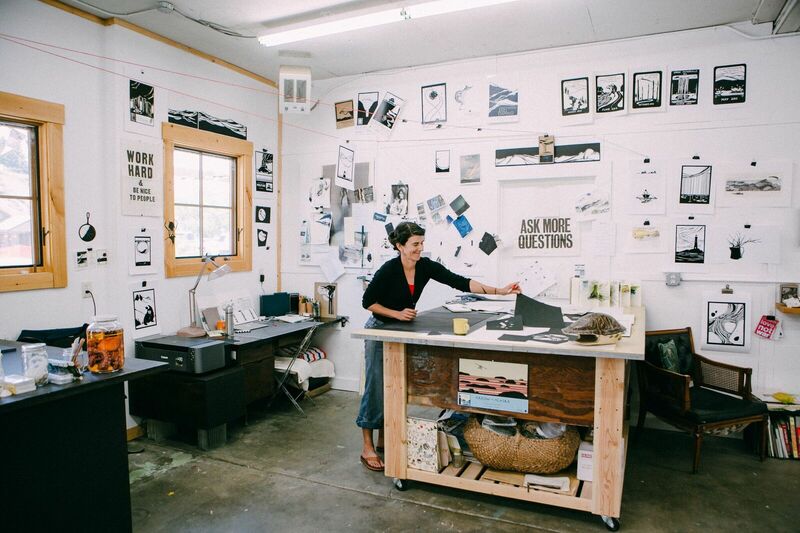 “It’s fun for work to be big and permanent – paper seems ephemeral in its own way,” she said. Viano hopes to find more ways to combine her favorite things by working with scientists to share their research in a way that motivates everyone. There’s a role for artists, dancers, and musicians to catch the attention of people who think they aren’t interested in science, she said. “There’s a lot of room in science for all different ways of interpreting and presenting information,” she said. When your work blends art, science, and movement, there’s no shortage of possibilities. “I actually made a list the other day that’s titled ‘Balls in the Air,’” said Viano. 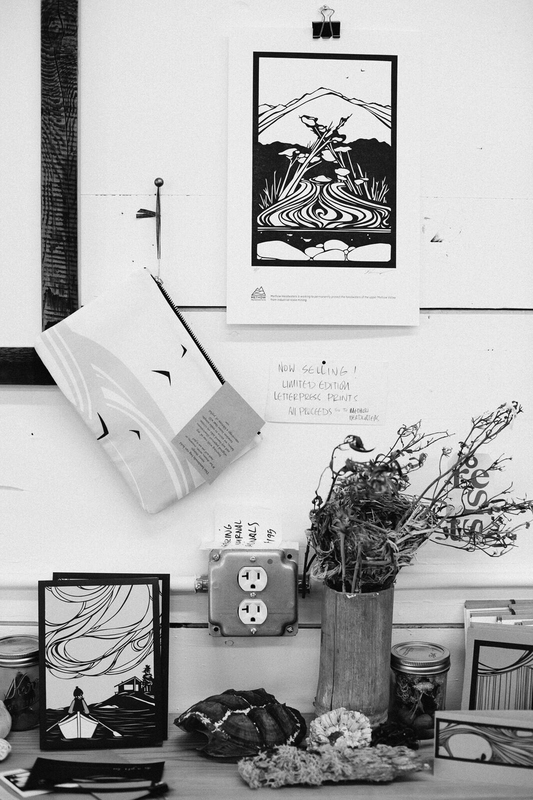 Hannah Viano’s studio is in the South Warehouse (Building 10) at TwispWorks. Visit her website to view her work HERE. Photographs were taken by Sol Gutierrez. View her artist page HERE.